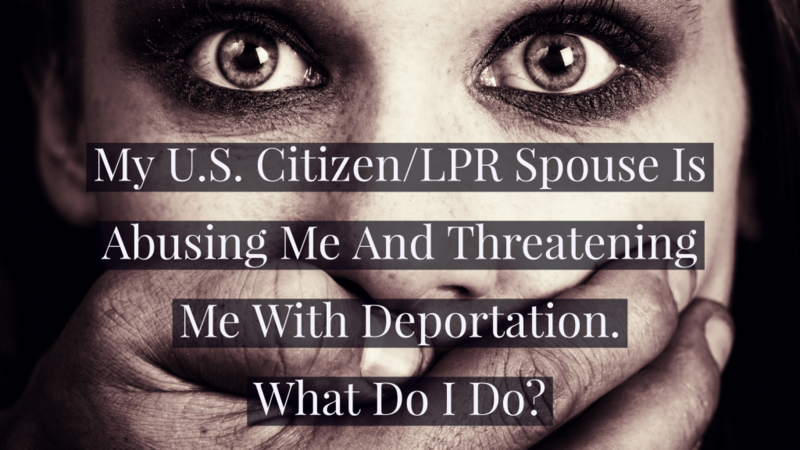 My U.S. Citizen/LPR Spouse Is Abusing Me And Threatening Me With Deportation. What Do I Do? Unfortunately, immigration lawyers around the country often get calls from petrified non-U.S. citizens who are in an abusive relationship and living in fear of deportation. A United States citizen who marries a non-citizen can file an I-130 petition on the spouses behalf to pave the way for the immigrant spouse to obtain a greencard. If the United States citizen withdraws the petition, the immigrant spouse can no longer adjust based on the marriage to the U.S. citizen. So, in some situations, U.S. citizens take advantage of this leverage to abuse and control the non-citizen spouse. They say things like, “If you don’t do what I say, I’ll have you deported.” They threaten to call immigration and withdraw the petition. They threaten deportation if the abused non-citizen spouse contacts law enforcement. For these reasons, the government passed a specific act to protect these victims. It is called the Violence Against Women Act (VAWA) and it allows an abused spouse to obtain a greencard, even if the U.S. citizen spouse withdraws the I-130 petition and even if they divorce their U.S. citizen spouse. The Violence Against Women Act, or VAWA is a federal law that was passed in 1994 designed to address domestic violence against women. The law is broad and encompassing, but one of the goals of VAWA was to protect immigrant victims of domestic violence and to help them escape their abusers. VAWA allows immigrant spouses or intended spouses of United States citizens and Lawful Permanent Residents to obtain a greencard (lawful permanent resident status) without the need to have the U.S. citizen or LPR spouse petition on his or her behalf. What is Adjustment of Status and How Do I Adjust My Status to Get a Greencard? 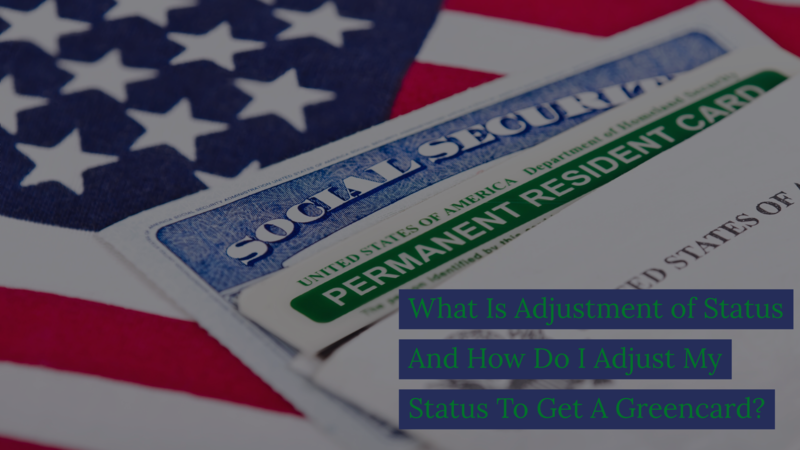 The term “adjustment of status” is an immigration legal term that refers to anyone who has been “admitted or paroled” into the United States who “adjusts” status to that of a lawful permanent resident. In other words, if you are inside the United States, you would adjust your status to obtain a greencard. If you were outside the United States, you would apply at a consult for an immigrant visa and then enter as a lawful permanent resident. Adjustment of status is different than a “change of status,” where you would change status from one temporary visa, for example an F visa (student visa) to another temporary visa, for example, and H1B visa (employment visa). Adjustment of status is the fist step towards becoming a United States Citizen. Who can adjust status and obtain a green card? There are several ways to adjust status in the United States. The most common ways are through marriage to a United States citizen or through asylum. However, victims of crime and those with certain employment opportunities or investment opportunities may also be able to adjust status. I Am Not A United States Citizen. What Can I Do If I Am The Victim Of A Crime? You’re not a United States citizen. You came into the United States with no documentation. You have been the victim of a crime. You’re scared. You don’t feel like you can go to the police because you might get deported. What can you do? What should I do if I was the victim of a crime? If you were the victim of a crime, there are options for you, even if you are here without documents. You just need to talk to an immigration lawyer to discuss those options. The government has provided protection for those non-citizens who are here without documents and have been the victim of a crime. It is called a U visa. The government has created a safe harbor for people who have been the victim of a crime. 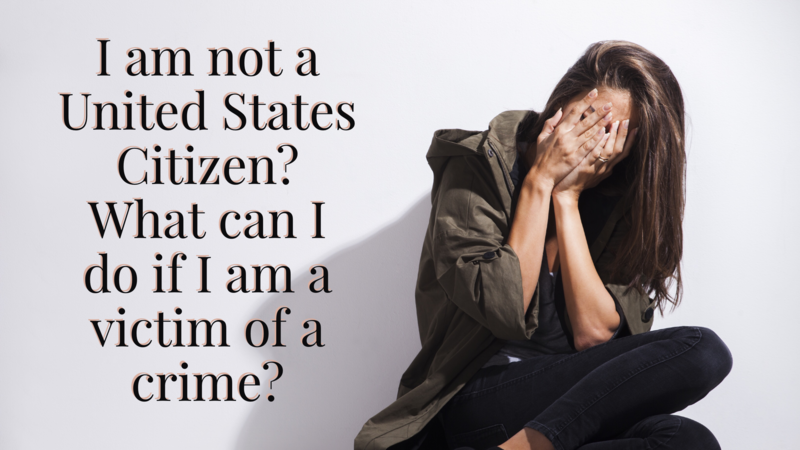 If you were the victim of a particular crime and you cooperate with law enforcement, you may be eligible for a U visa and ultimately, a green card. Did You Get Married Shortly After Entering the United States? 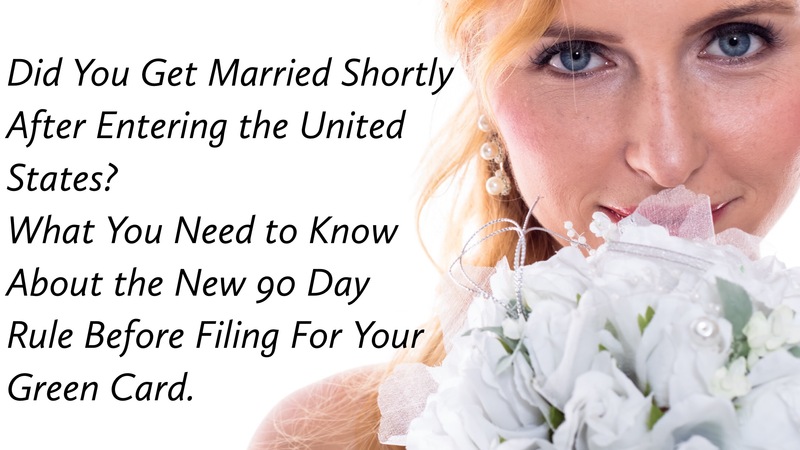 What You Need to Know About the New 90 Day Rule Before Filing For Your Green Card. President Trump’s administration has recently changed a longstanding rule that has placed immigration lawyers on notice relating to a common occurrence in immigration law. Many non-U.S. citizens enter the United States on Visitor Visas for many different reasons. To visit family, to take a vacation, to see what the United States is like. It is not uncommon for non-citizens find love and decide to get married to a U.S. citizen while in the U.S. on vacation. While many may call this impetuous, it is not a situation that is confined to citizens and non-citizens. The difficulty arises when you apply for a green card based on your marriage to a United States citizen when your marriage was within a short period of time after you entered the United States. You could be denied a green card based on what is called “preconceived intent.” So, how do you establish that you did not have preconceived intent to get married and stay in the United States when you entered on a temporary visa? Well, the government has just made it a little harder with the implementation of the 90 day rule. This rule replaces the old 30/60 day rule. Temporary visas are just that. Temporary. In order to obtain a temporary visa, you must establish that you intend to depart the United States by the time your temporary visa expires. For example, if you have a visitor visa that is good for six (6) months, when you enter the United States, you must have the intent to depart the United States within six (6) months. If the government believes that you intended to stay in the United States longer than your temporary visa at the time you entered, this is called preconceived intent. Prior to entering the United States, you conceived the intent to stay longer than authorized. If you have preconceived intent, this is a violation of your status. The key issue for a determination of preconceived intent lies in what your intent was at the time you were admitted into the United States. It is not preconceived intent if you change your intent after you were admitted. For example, if you truly entered the United States simply to visit and intended to leave within the six months allotted under your visitor visa, but you fell in love and only decided to stay after you were already admitted, then this would not be preconceived intent. Regardless of your true intent, however, the problem arises when you apply to adjust your status and obtain a green card based on the marriage to a United States citizen that occurred within a short period of time after your admission to the United States. Immigration officials will not simply take your word for it. They will look to outside evidence to establish whether they make a finding that you had preconceived intent. Let’s take a look at the old rule that USCIS (United States Customs and Immigration Services) used to follow. 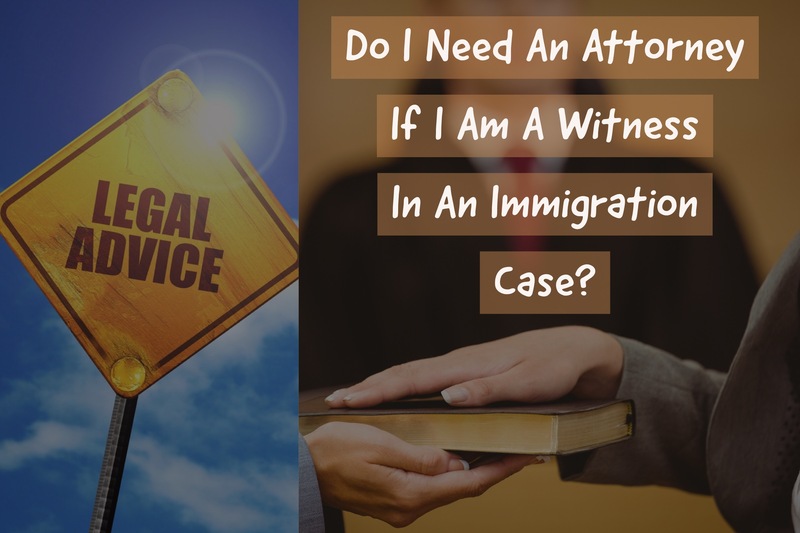 Do I Need An Attorney If I Am A Witness In An Immigration Case? If you are just a witness in an immigration case, you may think that you are safe from deportation and criminal prosecution, but under the Trump Administration, that is not the case. Increasingly, Department of Justice and Homeland Security officials have been calling for more criminal prosecutions and deportations in immigration-related matters. Even if you are not the person facing deportation in immigration court and you are only a witness, you could be in jeopardy. When you testify in immigration court for a friend, family member or employee, you have to swear under oath to your testimony. If you lie during a hearing, you can be prosecuted for perjury or giving false statements to a federal official. If you admit to committing crimes or engaging in acts that can get you deported as a non-citizen, you can be criminally prosecuted, put in prison and even deported. Under the Trump administration Immigration and Customs Enforcement (ICE) Attorneys and even Immigration Judges are becoming much more enforcement oriented and looking for cases where people admit to immigration-related crimes and grounds of removability during other non-citizen’s immigration cases. What Will Happen At My Immigration Interview? Some Helpful Tips. What Immigration Benefits do I Qualify for if I entered the United States Illegally? What am I eligible for? 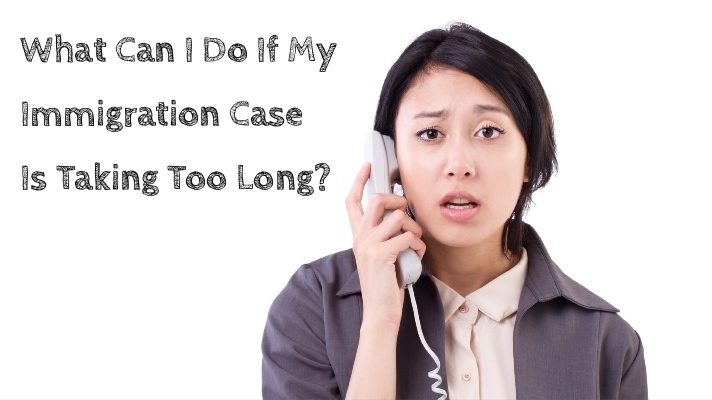 That is a very common question for many immigrants who call or visit our immigration office for legally advice. “I came into the country illegally,” how do I get a work permit or a green card? The truth is if you are in the United States and you do not have status and you did not enter after having been inspected and admitted or paroled, your immigration options can be quite limited. Our immigration laws changed dramatically in the 1990s and early 2000s and one of the big changes was to punish people who entered the country illegally by greatly limiting their ability to stay in the U.S. legally. There are five basic immigration options possibly open to you if you entered illegally and are currently out of status; 1) Asylum/Withholding/CAT; 2) U/T/S Visas; 3) 245(i) Adjustment; 4) Cancellation of Removal; 5) TPS. At first blush, you may say, wow those are quite a few options, sounds great, how do I sign up. Therein lies the problem, most people who are in the United States without status after entering without inspection will not qualify for any of these forms of immigration relief. That’s right, unfortunately, just because you have been in the U.S. for many years, have family here, have a job here or have a fear of going back to your home country does not mean you qualify for any form of immigration relief. Lets briefly review what it takes to qualify for these immigration benefits/relief. Last week, President Obama issued the first major change in U.S. immigration policy towards Cubans in over 20 years. On January 12, 2017, President Obama announced that the 1995 immigration policy designed specifically for Cuban nationals, known as “Wet-Foot/Dry-Foot”, would be abolished immediately. That means that Cuban nationals arriving at air, sea and land ports would now be subject to expedited removal (they were not previously) and that the Cuban government has agreed to review Cuban nationals with final orders of removal on a case by case basis to determine if they would allow them to be deported to Cuba. In addition, Cubans who arrive in the U.S. without visas and without having been admitted or paroled will not receive special parole consideration. They will be considered for parole like any other foreign national. Parole is the primary way that Cubans become eligible to adjust status in the U.S. and get their green cards. This is a major, major change to how the U.S. government treats Cuban nationals coming to, or attempting to come to the United States. No longer will they be welcomed into the air, sea and land ports, automatically given parole into the U.S., and a year and day later, be allowed to apply for adjustment of status under the Cuban Adjustment Act. Just for background, the 1995 Wet-Foot/Dry-Foot Policy, enacted by President Clinton, restricted Cuban nationals, who would be paroled into the U.S. and allowed to apply for green cards, to those who actually made it to U.S. soil before immigration officers caught them. Previously, Cuban nationals caught on boats or rafts in the Florida Straits, on their way from Cuba to the U.S., were brought to the U.S. and paroled into the country, rather than being sent back to Cuba. Wet-Foot/Dry-Foot greatly limited the number of Cuban nationals who made it to the U.S.
What is a FOIA (Freedom of Information Act) Request and do I need one for my Immigration Case? Yes, absolutely and without a doubt, if you have a pending immigration case, an old immigration case you want to reopen or you are not a U.S. citizen and want to know about your immigration history, you need a FOIA and you need it now. Information is power and FOIA is information. The federal government loves to use acronyms to describe everything, whether its DHS, ICE, USCIS, CBP, LPR or USC, if you can break a phrase down into letters, Uncle Sam will do it. 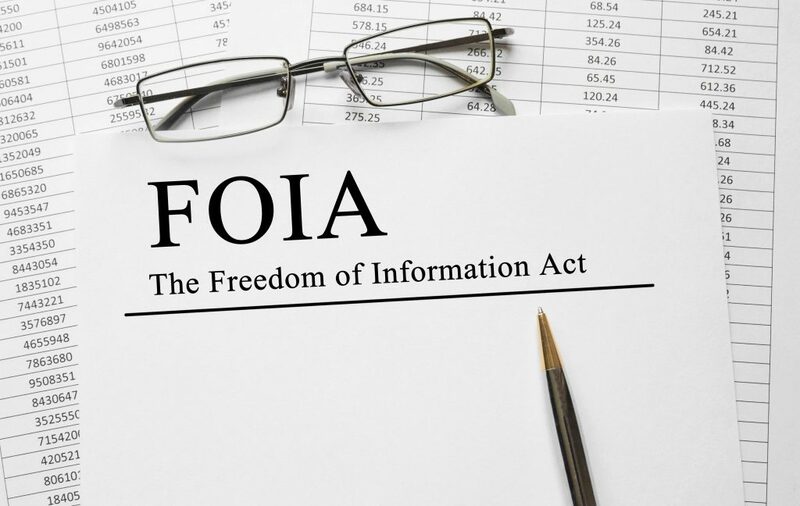 FOIA is just another example of that and stands for “Freedom of Information Act.” Knowing how to request one and having the right attorney review it could be the key to winning your immigration case or losing and getting deported. When I worked for U.S. Immigration and Customs Enforcement (ICE), we had unlimited access to data and the files of everyone who had an A-file (Alien file). We had vast networks of systems that compiled data on individuals in the U.S. who were born overseas or people deported from the U.S. who were trying to come back. If you know where to look, you could find a tremendous amount of information that could help immigrants trying to avoid deportation. However, most of the time, the government immigration attorneys, officers and agents would keep the information to themselves and often use it against the immigrants. One of the greatest resources that the federal government has, as it relates to immigration, is information. This is not information that is public record like in criminal cases. Federal government immigration information is protected by a variety of privacy laws and policies. This means, usually, only the person that is the subject of the record can request it, and the government can hold back some of the information for a variety of reasons.